**I certify this contribution made by me is from my own personal funds and I will not be reimbursed for it from any other source. Click here to see Contribution Eligibility and Contribution Limits – page 24. Can Corporations and trade unions continue to make political contributions? No, beginning on January 1, 2017 only individuals who are residents of Ontario can make contributions to political parties, constituency associations, candidate campaigns, and leadership contestants registered in Ontario, and as of July 1, 2017 to nomination contestants. What are the new contribution limits to a political party? The annual contribution limit to a political party is $1,200.00. There is no additional amount that can be given during campaign periods. What is the new contribution limit to a constituency association? The annual contribution limit to a constituency association is now $1,200.00. This limit also includes contributions to nomination contestants registered on or after July 1, 2017. What is the new contribution limit to a candidate’s campaign? The contribution limit to a candidate’s campaign is now $1,200.00. Are contributions still eligible for a tax credit in Ontario? Contributions to political parties, constituency associations, candidates, and leadership contestants are eligible for a tax credit. However, contributions made to nomination contestants are not eligible for a tax credit. What does “certification by donor” mean? Certification by donor means that when a person makes a contribution, at the time of the contribution the person’s formal statement that the funds actually belong to them must be documented. The way charges for your transaction appear on your billing statement depends on whether you’re donating to the Trillium Party of Ontario or to one of our Riding Associations or Candidates. For contributions made to the Party, the charge will appear as ‘Trillium Party Fund’. * 33.33 % on the portion between $1,354 and $3,081 in 2018. Tax-deductible receipts are issued for all donations over $20. For donations made online you’ll receive a confirmation email within a few minutes of your transaction. Official tax receipts for all donations will be mailed within 12 weeks of your donation or by February 28 for year-end contributions. Can I donate by mail or fax? Yes. Simply download our donation form and then mail or fax it to the address below. You’ll need the free Adobe Acrobat Reader to open this form. Acrobat Reader here. I’m already a donor. How do I update my personal information? 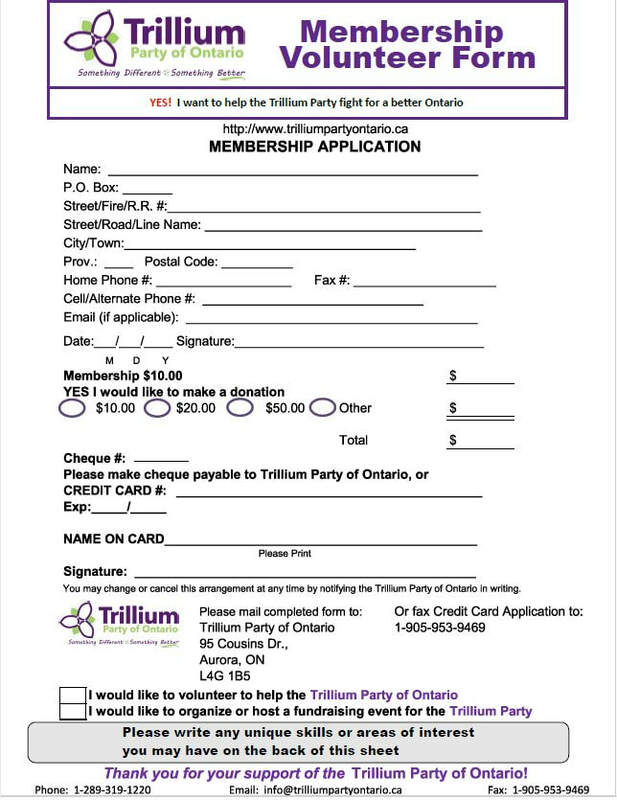 If you’ve donated to the Trillium Party of Ontario or to any of our Riding Associations or Candidates and have recently moved, changed your phone number or email address we’d like to hear from you. Please email us your updated contact details or call us at 1 289-319-1220, Monday through Friday from 9 a.m. to 5 p.m. EST. The security and confidentiality of your information is our top priority. The Trillium Party of Ontario uses industry-standard SSL (secure socket layer) technology to keep your personal information secure. Whenever you see ‘https’ in the address bar at the top of your browser this means that you are in a secure session and that all information exchanged is encrypted. All credit card information is securely transmitted to industry leading PayPal for processing. We do not retain any of your credit card information after your transaction has been completed.